← Censored by Singapore Art Museum, AGAIN! A King’s Ransom: Really? S$30/head to enter ArtScience Museum? I had recently written an email to the National Heritage Board of Singapore (see below). I was spurred on by the opening of the Marina Bay Sand’s new ArtScience Museum. I am a Singaporean, and a long-time heritage-supporter. I refer to yesterday’s opening of the ‘ArtScience Museum’. 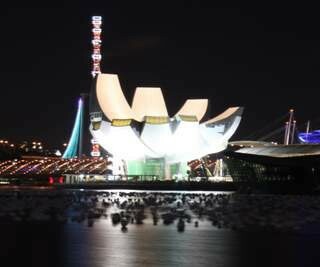 On its website (http://www.marinabaysands.com/ArtScienceMuseum/#tabs_1_1), it claims to be “…Singapore’s gift to the world”, implying that it is a ‘nation-sanctioned’ project. I wonder how this new museum is associated with NHB, seeing how the latter is involved in the ‘Shipwrecked’ exhibition? Let me clarify. Since NHB is involved as a joint organiser in that exhibition, I am curious about a possible conflict. With ICOM’s definition of a museum as ‘non-profit’ (see http://icom.museum/who-we-are/the-vision/museum-definition.html: “A museum is a non-profit, permanent institution…”) and that the ArtScience Museum is likely to be a profit-driven institution, where does NHB stand as a non-profit statutory board that is involved with exhibiting in a profit-driven institution? On another issue, since the ArtScience Museum is a profit-driven institution, it seems to be inappropriate for it to have a ‘museum’ tag to its name, considering ICOM’s definition. Since NHB is working closely with the new museum, does it imply that it has given approval of this ‘museum’ tag despite the inconsistency? As a heritage-supporter, I am glad that the Tang cargo is finally on display after so many years in the store. However, I am not pleased that even though the artefacts are likely to have been purchased with public funds (i.e. Sentosa Leisure Group is a statutory board which had purchased the collection at a reported USD32million), a Singaporean like myself still has to pay an exorbitant S$30/head to see this public-funded Singaporean collection. I humbly seek your views/clarification on the above matters. 1. The ArtScience Museum clearly should NOT be named a ‘museum’, going by global conventions. If the National Heritage Board (with oversight of public/private museums/galleries in Singapore) is involved with the ArtScience Museum, does it imply that the NHB condones its use for profit-making purposes? 2. The Tang collection is clearly bought with govt-money. How can it make sense, then, that a Singaporean has to pay S$30 to see what is essentially a Singaporean-collective-owned collection (compare that to S$10/head at National Museum Singapore)? Based on the info already available online, the Sackler Gallery in Washington DC will host the exhibition soon, and they usually do not charge an entry fee. This means that this Singaporean collection will be seen ‘free’ in USA, whereas Singaporeans must pay to see it at home! In their reply to me, NHB did not address the ‘museum/profit-making’ oxymoron in point 1, nor did they give an adequate reply to point 2. In the rush to cement more global tie-ups and international exposure, NHB must remember that it is funded by the blood and sweat of Singaporean taxpayers.